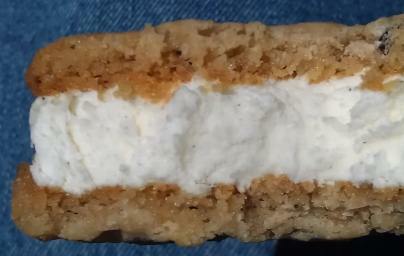 Do cookie ice cream sandwiches taunt you like they taunt me? One local Massachusetts company has been taunting me for years and their name is 600 lb gorillas. Whenever I would walk through BJ's freezer section, I would see their big box of 12 sandwiches calling to me. "We're just $9.99 - Buy us". I picked up that box several times, flip it over, and then remember I shouldn't eat something that's half of my daily saturated fat. What can I say? When something hits the 50% mark, I get scared, especially when it means I'll be eating 12 of them. It's like Magnum bars. Sure they are tasty, but oh so unhealthy. I ran out to lunch for a little change of pace. 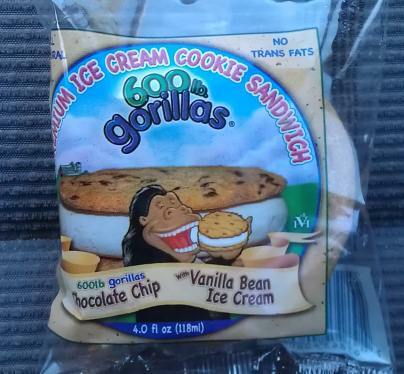 I swung over to Roche Brothers and what do I see but individually wrapped 600 gorillas ice cream sandwiches at 2 for $3. Oh yeah, time to indulge. With Vanilla Bean Ice Cream no less! You know what? With such a big company name, I expected larger. I thought I would be sneaky and do a side view quarter test... Yeah, didn't work. Hopefully you can still see all the wonderful vanilla bean flakes. The great news here is that my $1.50 was very well spent. This sandwich is excellent. 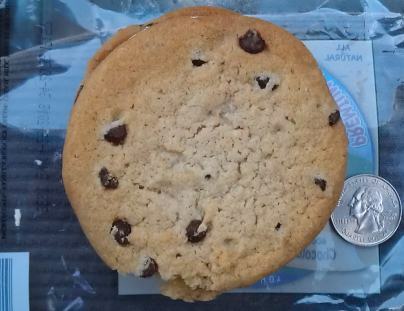 What sets this one apart is the soft and flaky chocolate chip cookies. Now granted mine had a few minutes to thaw while I checked out and headed back to the car for pictures, but the overall consistency was just wonderful, it really was. The breeze from the cranked up air conditioner was literally enough to knock a few loose pieces of cookie off, it's just that delicate. I can't believe this cookie was frozen just five minutes ago. Now don't be worried that this is some mushy thing that will stick to your fingers and just make a mess. It had just enough goo to hold it together but not so gooey as too feel heavy and overfilling. Can't say enough about the cookies. Could they use a few more chocolate chips in them? Maybe, I guess it's possible if you are use to cookies with the edges rolled in chips, but that's the worst critique I could make here. Personally I think I like them just the way they are. Notice in the picture that the cookie to ice cream ratio is about 1 to 1. It's a wonderful ratio here because it's a soft, rich, creamy ice cream that's happy to tie these excellent cookies together. The flavor is simple and clean and is happy to take the back seat here. I wish all sandwiches were held together with something similar instead of the typical bland or gummy substance that we find all too often. Thank you On Second Scoop! We love getting reviewed and your conclusion (“Verdict? Excellent; Buy Again? 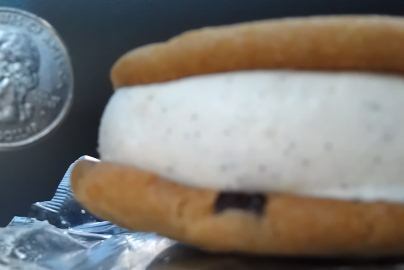 Definitely”) is why we love making 600 lb Gorillas ice cream sandwiches. Thanks for noticing the real vanilla bean and for commenting on the taste and consistency of our cookies. We worked hard to develop an all-natural, delicious product and the cookies had to be outstanding— after all we were a ready-to-bake cookie first! About the measures you noted on the packaging, there‘s no trickery. We’re required by FDA to print the volume in fluid ounces (4.0) and the weight (3.4). I should say thank you for making these, they really are excellent and I look forward to having them again.